Although it doesn’t incorporate a pitch to allow the elements to roll off, the flat roof is proven as an efficient method of covering commercial buildings with the first layer of protection against the weather. The flat roof has some advantages over a pitched roof, notably the ease of access for inspections and repair work. They also tend to be less expensive to replace, for the aspects of both the materials and labor. The most obvious sign of damage is when you begin to see water leaks inside the building. This is, of course, not ideal. Much better is to have a professional commercial roofing company conduct regular inspections and find any damage or wear before it causes such a large problem. There are visible signs of wear as well as subtle distinctions in the roof that a professional can spot and determine if a repair is needed. There are obvious times to conduct repairs and perform maintenance on a flat roof. During an annual inspection is likely the best time for minor maintenance projects. Of course, any time other work is conducted on the roof with air conditioning systems or exhaust pipes and fans, they should be resealed after the work is complete to assure a leak doesn’t form. When the roof is older and either hasn’t been properly maintained or has gotten to the point that it’s made up of more repairs than original roofing, it may be time to replace. Although professionally conducted repairs are reliable and maintain the roof’s integrity, they can leave a weak point, so once there are a certain amount it may just be time to replace the entire roof instead of fighting it one spot at a time and risking a much more expensive problem. 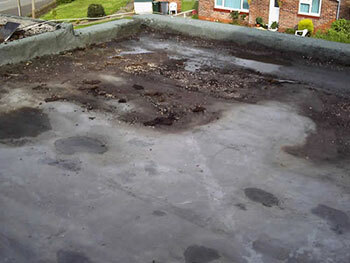 If your commercial flat roof is damaged and needs commercial roof repair or replacing contact us today.